Renato D’aiello is a professional musician playing sax at Ronnie Scott’s Bar. 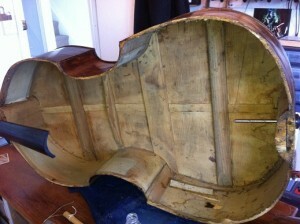 He came to me when his bassist’s 200 year old double bass had a severe accident. 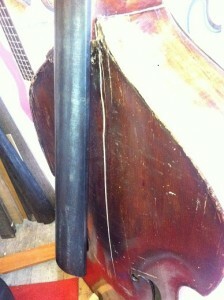 This shows a crack in the front, running half way down the middle of the bass. The bass had a lot of old woodworm all over, making areas very weak and compromising the sound. 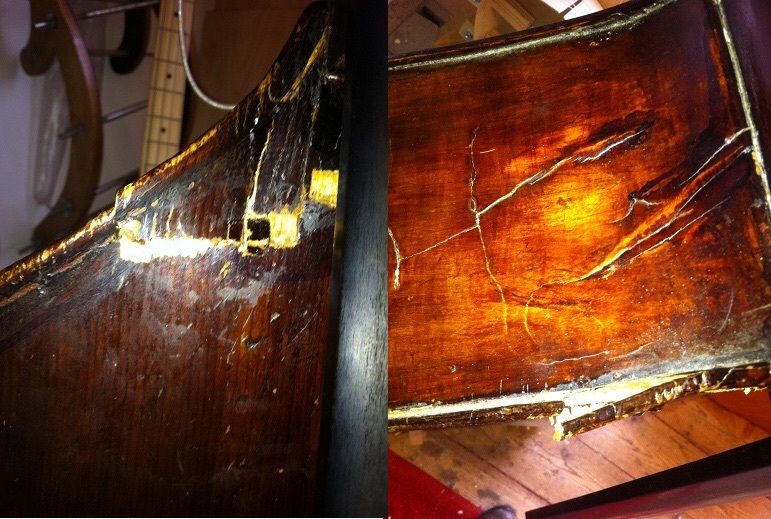 When it fell the front was cracked across the grain under the fingerboard. There was also serious cracking to the top left of the front and upper bout. The next photos show the damage to the ribs. The two upper corner blocks had come away. When the front was removed I could see that some of the struts across the back had also come away. The label inside shows some old repairs from 1942 most of which i had to redo as the new cracks were in the same places. This was a chance to restore areas to a better finish. The very top of the front had to be completely rebuilt and the strengthened with half edging. After a few more crack repairs and some patches to reinforce the whole front was cleaned from old excess glue. And finally aftersome of the most enjoyable work I have done this year. It was restrung.